Afterwards, they can hold any other debate at any venue. 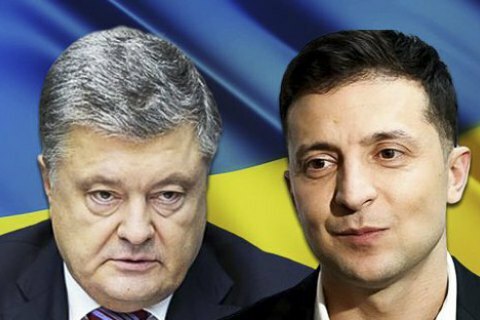 An official debate between presidential candidates Petro Poroshenko and Volodymyr Zelenskyy is scheduled for 7 p.m. on 19 April, the head of the Central Electoral Commission, Tetyana Slipachuk, and the head of the National Public TV Company, Zurab Alasaniya, said at a briefing on 9 April. Alasaniya noted that the company is prepared to host an hour-long debate as stipulated by the law and relevant regulations. If a candidate does not show up, the debate is to be replaced by a neutral video saying that this candidate ignored the norm of the law. Afterwards, the candidates may agree to hold any other debate or talk show in a different venue. According to the candidates' earlier statements, Zelenskyy wants a debate to take place at the Olympic Stadium in Kyiv on 19 April, Poroshenko is prepared to take part in a debate on 14 and 19 April.